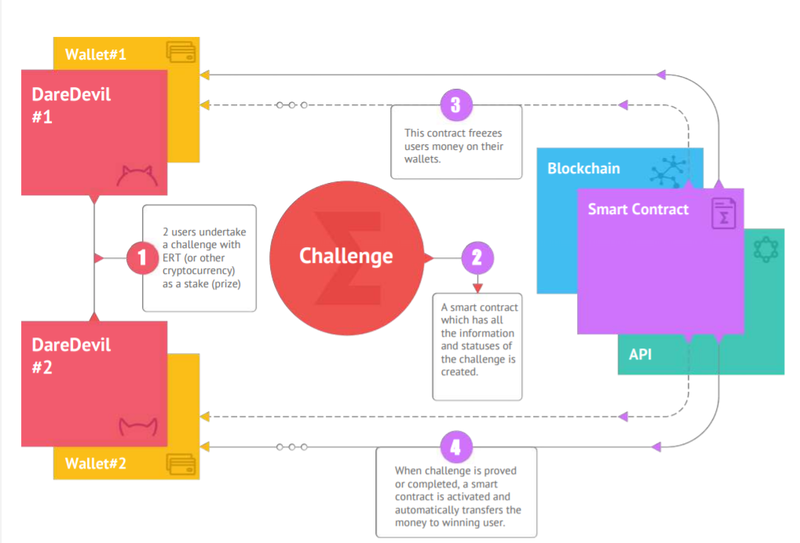 Eristica combines the power of blockchain technology and funtech to create platform that unify challenges as seen on todays existing platforms such as youtube into one single mobile platform, where users post videos with their challenges, challenge others and compete for top places in the overall ranking. Eristica solves some of the problems currently facing in the entertainment realm such as trust, control over national currencies, legislative restrictions, the absence of a global market imposed by the classical monetary system. Eristca platform has been in existence since 2015 and has a considerable amount of users already. On Eristica, participant can develop and enter a challenge if you remember the days of planking contest, ice water challenge etc, users provide video footage of challenges completed and get ratings based on the results. Eristica offers opportunity for users to get a reward for winning challenges, receive virtual reward from successful predictions and buy access to all services of the platform with Eristica token. Before i go deep down into Eristica and how it works, i will quickly give an explanation of Cryptocurrency and Token for those that do not understand the what and hows of these terms. You can skip this part if you already do. Terms like decentralized, distributed and disintermediatipiqued my interest, but I lacked the technical understanding to really understand what I was looking at. Eristica harnesses the power of blockchain technology and funtech to provide an ecosystem where users can create and join a contest for a reward. The users of Eristica will get the opportunity to create completely different types of challenges, including competitions in online games, offline bets , as well as mass competitions. Financial indicators and fees in the industry of Bets and Challenges are not uniform and sometimes the disparity can be exorbitant. Bets are usually subject to bookmaker or intermediator firms meaning that the fees can rise up to 20%. Wallet: Every accounton Eristica platform will have a wallet features for users to transfer, withdraw and receive tokens. Eristica Game API: The game API is a simple and easy-to-use software interface will make it possible to integrate Eristica services into games on various platforms. Gamers can win Eristica tokens in challenges with friends and spend them on in-game purchases inside the game right after that. Circulation of tokens will run through both the Eristica platform itself and the partner applications with economic links, thus, forming a strong and lively ecosystem. Eristica token (ERT) will be released during the contribution period. Eristica will sells ERC-20 compatible Ethereum-based ERT token. The aim of the token sale is to provide a discounted participation for the early adopters of the decentralized platform. To provide a functional lending market to such extent, early adopters are required. By purchasing ERT, the early adopters receives a discounted price for using the decentralized lending platform. The ICO has been structured to give the best opportunities to anyone who would like to participate from the very beginning, providing maximum flexibility and control for the participants. Eristica token (ERT) will be used to purchase and make incentive payment on the Eristica ecosystem. It will also be used to provide incentive for early adopters.